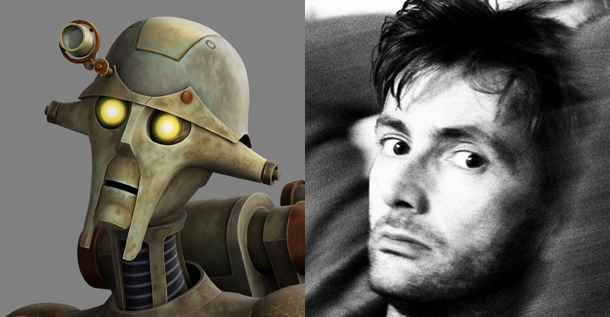 David Tennant voices Huyang, a droid, in Star Wars: The Clone Wars starting in the episode which premieres on Saturday 10th November in the US on the Cartoon Network at 9.30am Eastern. The episode is called A Test Of Strength. Star Wars: The Clone Wars have a history of using stars to voice various characters. David's character is an ancient droid who is in the service of the Jedi Order, whose sole task in life is overseeing the construction of lightsabers. He meets the group of young Jedi who are setting out to build their own lightsabers in a story which started the previous week. IGN (who first reported this news) posted that the reason David Tennant was asked for the part was that supervising director, Dave Filoni remarked explained "As a fan that has the privilege of playing in the Star Wars galaxy, I am always on the lookout for others who appreciate, and would enjoy, an opportunity to go on an adventure in George’s galaxy far, far away. When I heard the Doctor himself, David Tennant, was a fan of Star Wars I knew I had to find a way to get in contact with him to see if he would perform on The Clone Wars. I thought David was perfect for the part and he did not disappoint. He delivered a performance which impressed even the Master himself, George Lucas." The second episode premieres on Saturday 17th November at the same time and is called Bound For Rescue with David's character also appearing in a third eisode on 24th November. For posts related to Star Wars: The Clone Wars on Blogger.com click here. David Tennant's episodes of Star Wars: The Clone Wars will be included in the Season Five box-set DVD. It is released in released in UK on Monday 14th October and in US on Tuesday 15th October.